People knew how to make lovely pies a hundred years ago. 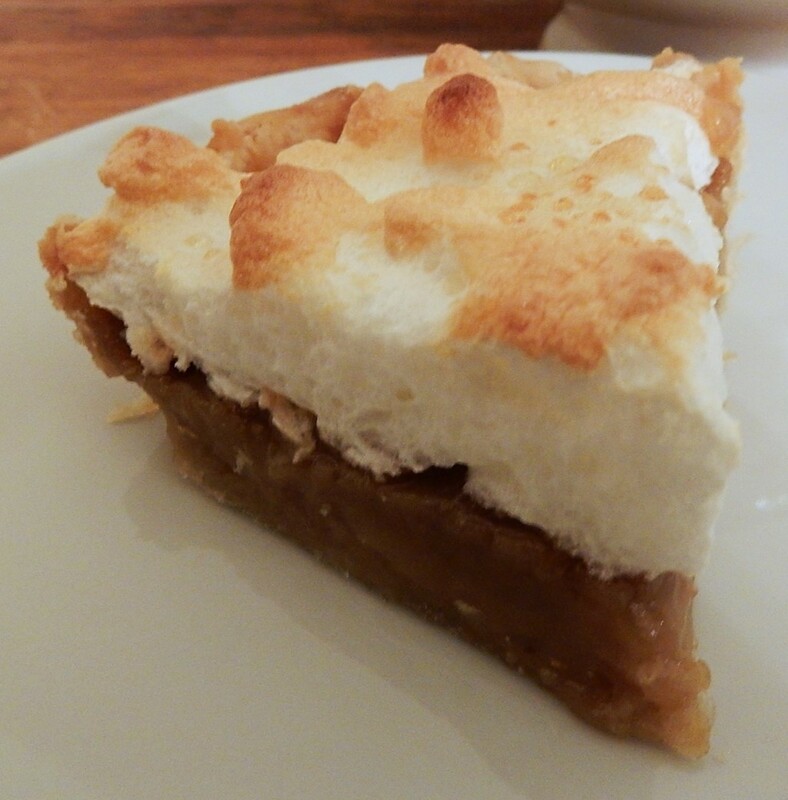 An old-time winter favorite was Butterscotch Pie with Meringue Topping. I found this classic recipe in the February, 1916 issue of Good Housekeeping. Preheat oven to 325° F. Combine brown sugar and hot water in a saucepan, bring to a boil. In the meantime, in a small bowl combine the flour and salt. Gradually stir the cold water into the flour mixture to create a smooth paste; then stir in the beaten egg yolks. Add one tablespoon of the hot sugar liquid to flour and egg yolk mixture and stir to combine; then add several additional tablespoons of the hot sugar liquid while stirring constantly. When enough liquid has been added to make a thin paste, stir the flour and egg yolk mixture into the remaining hot sugar mixture in the saucepan. Using medium heat, bring to a boil while stirring constantly; reduce heat and simmer while continuing to stir until the mixture thickens. Remove from the heat and stir in the butter. When the butter is melted, pour into the pie shell. To prepare the meringue, put the egg whites into a mixing bowl. Beat until peaks form, then beat in the granulated sugar. Spoon the meringue onto the top of the pie, and then swirl. Use care to get the meringue spread all the way to the edge of the pie. Bake in the oven for approximately 10 minutes or until the meringue is a light brown. Posted on January 31, 2016 January 30, 2016 by SherylPosted in FoodTagged pie, recipe. Wow! This is really an old recipe and must be good! It makes a very nice pie. OMG! It sound so-o-o-o good. And so-o-o-o much sugar. I can dream, can’t I? Sounds wonderful! I have never made butterscotch pie but it reminds me of a chocolate pie with meringue topping. A lot of the old-time pies had meringue toppings–another one that comes to mind is lemon meringue. Wow, it is just before midnight here but I could easily gobble that down. It looks absolutely delicious. If he likes butterscotch, he’d enjoy this pie. It’s nice with a hot cup of coffee on cold winter days. Oh my, that looks so good, did they have pre-made pie shells 100 years ago? No, I don’t think that they had pre-made pie shells back then. The original recipe in the old magazine said to, “Bake a shell of flaky pastry.” When I made this pie I actually made the crust from scratch, and pre-baked it. The only tricky thing about baking an empty pie shell is that it tends to slip down the edge of the pan and shrink. I kept checking on the shell when it was in the oven–and eased it back up to the top edge of the pan if it began to slide down. I also pricked it with a fork to keep it from puffing up. Of course you could buy a pre-made pie shell at the store. Yummy! I don’t think I’ve ever eaten butterscotch pie. Seeing the meringue brought back memories of home-ec in high school. I didn’t know until then how meringue was made. It still intrigues me. Meringue is fun to make. It always seems like a bit of a miracle how the clear egg whites puff up, turn white, and form peaks when beaten. Oh, yum. I think I’m going to try this. I’ll let you know when I do. The meringue topping in your photo looks perfect. I think that you’ll like it. I’m looking forward to hearing how it turns out. When I made this pie, the thing that I found most difficult was getting the pudding mixture to the right thickness (so that it would hold its shape in the pie). I stirred it constantly until it thickened, so that it won’t burn on the bottom of the pan. Omgosh you made that???? Its beautiful! Now I am impressed and my address will follow!!!! Yummy!! I was pleased with how it turned out. It did make an attractive pie. This does look good. 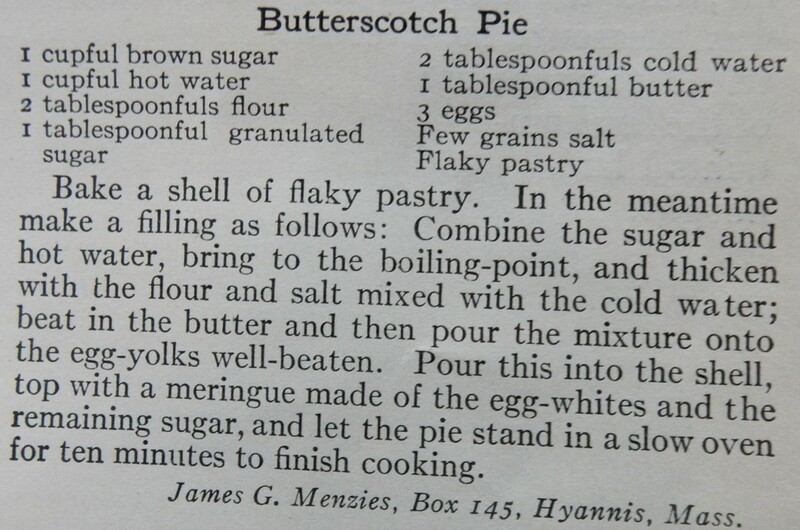 I don’t believe I’ve ever had butterscotch pie, although we used to have butterscotch pudding a good bit. If I were going to go to the trouble of a meringue, I’d probably go for coconut or lemon, but if someone were to plunk a piece of this down in front of me, I wouldn’t refuse it. There are a lot of different types of pie that have meringue toppings. . .hmm. . . I’m not sure which is my favorite. I like butterscotch pie,but coconut cream is a favorite of mine. Pies are just right down good!! Looks delicious, although somewhat off my food agenda at the moment. I love old fashioned recipes like this one – they are usually simple and delicious. I’ll have to try this one out soon. Like you, I really like old recipes because they often are so easy to make as well as delicious. My grandmother was big on the meringue pies–lemon, chocolate, coconut custard (! )–but she never made a butterscotch pie that I remember. It looks wonderful! I’m enjoying rediscovering meringue as I make recipes for this blog. For some reason, it seems like meringue pies used to be much more popular than what they are now. Hmm. On this occasion I’ll have to dissent from you all and stick to lemon meringue pie. It sounds tooth-achingly sweet. But thanks for an interesting recipe. The pudding mixture is sweet, but it is nicely balanced by the meringue which has very little sugar in it. Fair point. I’ll have to give it a whirl. Looks lovely & delicious, Sheryl! You’re absolutely right. This recipe nicely stands the test of time. Pass another piece of pie please! Really appreciate you testing out these recipes …now if only you lived a little closer I’d be happy to volunteer to help. Butterscotch Pie. Oh so beautiful. But what is so amazing is the wonderful comments from your followers. Beautiful group. The blogging community is wonderful. I’ve really enjoyed getting to know you (and other readers) via our blogs. A recipe sent in by a man! Did that happen often a hundred years ago? I also was surprised. Cooking was much more of a female activity a hundred years ago. This is the first time that I’ve ever noticed a recipe contribution to the magazine from a male. I wonder if the recipe sender was a chef. Or sending it on behalf of a shy wife. yummm we don’t really do sweet pies in New Zealand and we are missing out this looks delicious!